Is PromoCodius a Scam? Read Reviews! TOS: There are no limitations pertaining to the number of coupons and discount codes you’re being given access to. The number of opportunities will be heavily dependent on the country that you live in. Anyone who tells us they don’t like a discount will face a raised eyebrow. Who wouldn’t want to get a great product or a service at a fraction of the announced price? This is the premise that PromoCodius operates on. The startup from Ukraine was launched in 2014 for the purpose of giving users access to discount codes and special coupons. Should PromoCodius be trusted and are there actually people who have benefited from the discount? This PromoCodius review will give you all of the answers. PromoCodius is an international website aimed at delivering coupons, promo codes and sales. 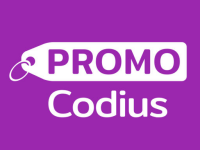 Currently, the PromoCodius coupons and discounts can be used in several countries – Ukraine, the Czech Republic, Sweden, Poland, Russia, USA, Norway, Finland, Denmark, Kazakhstan, Mexico, Belarus, Turkey and Spain. Obviously, the availability of the coupons and the stores that PromoCodius partners up with will vary from one country to the other. Since Ukraine is the platform’s country of origin, the network is most developed there. You can look for coupons or discounts via the PromoCodius website or you can download the company’s app. Both Android and iOS developments are available and the applications can be downloaded for free. The free promotional codes for store purchases apply to an array of products and merchandise options – household items, computers, electronics, restaurants, books, travel and tourism services, clothing, toys, footwear, beauty products and various others. There are three main types of promotional options to choose from: a discount code that makes products available at a reduced price, a shipping code for discounted or free of charge shipping and a gift code. PromoCodius does not sell the coupons. The company uses an alternative model to generate revenue. Since it is an affiliate of the stores participating in the program, a commission is gained each time someone makes a purchase through the use of a PromoCodius code. The official company website does not specify whether there are any limitations as to the type of people (age, professional affiliation) participating in the program. Obviously, you will have to be in one of the countries that belong to the PromoCodius network. Codes can be used both for actual in-store purchases and for online purchases. There doesn’t seem to be a limit as per the number of coupons or codes a single person can gain access to. What Are the Prizes Offered by PromoCodius? As advertised via the official presentation, PromoCodius offers discounts of up to 90 percent of the actual price of a product or a service. There are also discounts that aren’t presented by a percentage but rather – as a fixed sum. When you go to the US version of the website, for example, you will get a list of the available coupons. These start at 20 percent for some of the listed companies (currently, there are solely cryptocurrency deals for the US) and go up to much higher values. Free shipping options are also available for some of the online stores participating in the program. This is where things get to be a bit more complicated. While PromoCodius is being advertised as a startup initiative that was launched in Kiev, there’s no information about the company behind this development. The PromoCodius app is added to the app store by someone called Viktor Derkach. A LinkedIn search reveals that Derkach works for a company called Green Moby that develops Android and iOS apps. Obviously, this is the company responsible for developing the PromoCodius app rather than the concept itself. There is a phone number that was discovered through a startup website. If you have a more pronounced interest in finding out who is behind PromoCodius, this phone number or the available email address could be the ones to try. There isn’t a lot of restrictions as far as the terms and conditions go. You go to the website, you visit the page of the store that you’re interested in and you will be shown the discount code. Coupons are also available and these will have to be printed out in order to be used later on at a store of preference. According to the PromoCodius website, the company already has 6,300 brands in its network. All you have to do is go to the respective international website, click on the company that you’re interested in and review the coupon codes. All of them are listed conveniently. You will either have to copy the code and use it upon the finalization of an online purchase or you’ll need to print out a coupon and show it at a store that you’re visiting and that’s participating in the program. While the platform and the apps have been around for some time, it’s very difficult to come across a PromoCodius review. PromoCodius does not have a Facebook page, hence social media comments are also virtually non-existent. The best thing to do is to test out the coupon codes yourself. We did test out one of the Ukraine promo codes on the website that it referred to. The code cleared out and produced the promised discount in the final step of the checkout process. Is PromoCodius Scam or Legit? Based on the research and the test of the promo coupons, PromoCodius seems to be legit. Its usefulness will simply depend on your location. If you are in one of the countries where the platform was originally launched, you will get to benefit from a relatively wide pool of opportunities for getting a discount code. Other markets are still being developed. If you are in the US and you’re not interested in cryptocurrency deals, for example, chances are that you’re not going to be very impressed at the time being. Would you mind rating PromoCodius.com? While there isn’t information about the entity behind PromoCodius and the terms/conditions for use are limited, the website does seem to offer legitimate opportunities for getting a shopping discount code. Using PromoCodius is also fairly simple – you will either have to copy the code and apply it to an online checkout or you’ll need to print out a coupon and bring it with you to a store. Will we recommend PromoCodius? It really depends on your location and the types of purchases you’re interested in. There are no warning signs but if you do have some experience with PromoCodius, do not hesitate to share it with us!